If you like bandanas, have a baby and use a lot of bibs then BANDANA BIBS are for you! From Sourpuss Clothing comes these great little bibs in 8 or so different designs featuring a skull and crossbones, octopi, stripes, hearts and even a pink bandana featuring a white skull with pink bow! 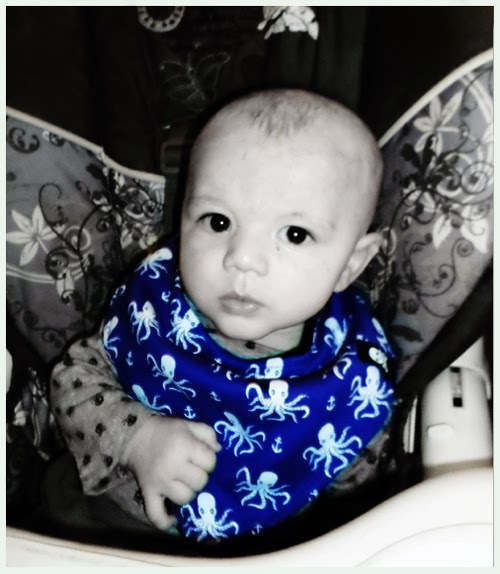 I had the chance to try out one of the skull and crossbones bibs along with the bib with the Sourpuss octopus design and I have to say they are darn cute! These bibs are vibrant, long-wearing, washable and great for any occasion from giving a gift at a shower or for dressing up baby at parties and activities as well as daily wear and a great value at just $12 each! If you like what you see in these bibs, head on over to the Sourpuss Clothing WEBSITE and take a look at the others and accessories to mix and match! There is something for everyone and they are a lot of fashionable fun! You can also find Sourpuss clothing on Facebook AND Twitter, too! Of course, there is MORE! The nice people over at Sourpuss Clothing are offering one of our readers the chance to win TWO Bandana Bibs of their choice (where available) and all you have to do is enter via the rafflecopter below, be 18 or older and live in the U.S! Thank you, enjoy and GOOD LUCK!! Disclaimer: I was provided with 2 bibs for review to complete this post. all opinions are my own. Thank you! i love the octopus one and also the hungry monsters!